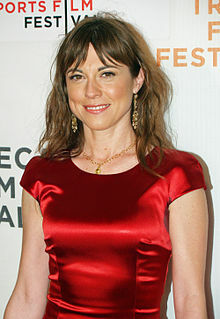 Rebecca Pidgeon (born October 10, 1965) is a British-American actress and singer-songwriter. She has maintained a recording career while also acting on stage and in feature films. She is married to American writer and director David Mamet. Pidgeon was born to English parents in Cambridge, Massachusetts, while her father, Carl R. Pidgeon, was a visiting professor at MIT. Her mother, Elaine, is a yoga teacher. Her paternal grandmother, Monica Pidgeon, the editor of Architectural Design, was the sister of artist Olga Lehmann and academic Andrew George Lehmann. She moved to Edinburgh, Scotland in 1970, with her parents. She holds dual American/British citizenship. She graduated from the Royal Academy of Dramatic Art in London alongside Clive Owen and Liza Tarbuck. From 1986-90, Pidgeon was the lead singer of the British folk/pop band Ruby Blue. She left Ruby Blue shortly after the band signed to a major record label. She appeared in her first feature film, The Dawning, in 1988 and then starred in David Mamet's plays and films, beginning with the movie Homicide and the play Oleanna, a part Mamet wrote for her. Pidgeon composed the music for the film version, which starred Debra Eisenstadt in her role. Returning to music, she released the album The Raven (1994), followed by The New York Girls' Club (1996), and The Four Marys (1998), a collection of traditional Celtic folk songs. Tough on Crime (2005) featured Walter Becker of Steely Dan on guitar and Billy Preston on keyboards. Behind the Velvet Curtain (2008) included a cover version of the Beach Boys song "Wouldn't It Be Nice". Slingshot was released in 2012. Pidgeon has had roles in several of Mamet's films, including The Spanish Prisoner (1997), The Winslow Boy (1999), State and Main (2000), Heist (2001), and Red (2010). She had a small role in Redbelt (2008). In the 2013 television movie Phil Spector she sang "Spanish Harlem" over the closing credits. She appeared in the U.S. television series The Unit, playing Charlotte Ryan, and in the 2007 television film Jesse Stone: Sea Change, playing Leeann Lewis, a murder-bank robbery suspect. Pidgeon is married to the American writer and director David Mamet. She met Mamet while acting in his play Speed-the-Plow during its run at the National Theatre, London. Although married at the time to actress Lindsay Crouse, Mamet began a relationship with Pidgeon. Mamet divorced Crouse in 1990 and married Pidgeon in 1991. Pidgeon and Mamet have two children, actress Clara and Noah, in addition to Mamet's two older children, Willa and Zosia. Pidgeon, who was born to a non-practicing Christian family, has converted to Mamet's Jewish faith. ^ Winters, Laura (April 5, 1998). "FILM; A Deft Stage Presence Moves Into the Movies". The New York Times. Retrieved May 22, 2010. ^ "Monica Pidgeon". The Daily Telegraph. London. October 20, 2009. ^ Rowntree, Diana (September 21, 2009). "Monica Pidgeon obituary". The Guardian. London. ^ "Hollywood previews". hollywoodpreviews.com. Retrieved 23 March 2012. ^ "Discography". Rebecca Pidgeon Music. Retrieved 23 May 2016. ^ Tabor, Mary B. W. (March 29, 1995). "Book Notes". The New York Times. ^ Weber, Bruce (November 17, 1994). "AT HOME WITH: David Mamet; Thoughts From A Man's Man". The New York Times. Retrieved May 22, 2010. ^ "Miami Herald". January 25, 2001.